Have you tried VLC media player? It lets you step through frame by frame and makes screen shots easy. It's also free. I've been using it for years. Yeah, VLC Media Player is a great player (and one of the best!). It works absolutely fine and has lots of features (more than other players)... For me, it's like an "allround"-Player. I use it for screen shots, my DVD's and videos, too. Thanks NickP for remembering me at this, I have to install it, too. This is the best I could do with Cyd as 'Purdey'. I had to time it to the split second and took me a few attempts, so if I had to go to that much trouble I guess they were doing their job correctly. 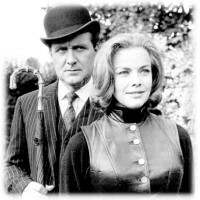 If nothing else it proves Cyd Child was, at one time or another, 'Emma Peel', 'Tara King' and 'Purdey' which makes her unique I'd say! Nice work, Dandy! She doesn't look totally unlike Joanna, I don't think. The scene itself is over in an instant, so there really isn't much of a chance to notice anything amiss, but it's not a bad likeness. Joanna was right to push for her. Thanks for putting the effort in to get that perfect shot. Never heard of it. I'll certainly have a look. Is this her or did someone else also double for Linda? Mary Fielder (wife of the infamous "Aitch") doubled for Linda in "Wish You Were Here" but that's not her; I'd guess it's probably Diane. Harry Fielder (Aitch) posts on Roobarb's and Britmovie. His wife sadly died a year or so ago I believe, but I remember him saying she once doubled for Linda. He's just written his autobiography by the way - Extra Extra Read All About It! which is available from his website. Great images of doubles! I've changed the thread title to 'Stunt doubles' for discussing them all. Could Honor have used a stunt double in The Charmers for the fencing scene? If you look at 1.25 on this clip Honor slips on her protective mask and walks behind a pillar and it look suspiciously like a stunt person is taking over. Well, I think she did this "stunt" herself. But, what I'm wondering about this: as that women throws the foil, it hits the baddy in his back. And the guy hasn't turned, as the foil hits him. Just looked suspicious to me, walking behind a pillar then emerge with her mask on, followed by very convincing swordplay. By the way, the scene where Cathy gets shot by Steed (Brief for Murder) was planned to contain another one showing her coming out of the water (source: Avengers 50th anniversary book) but was that scene filmed and rejected then or just cancelled during the production ? 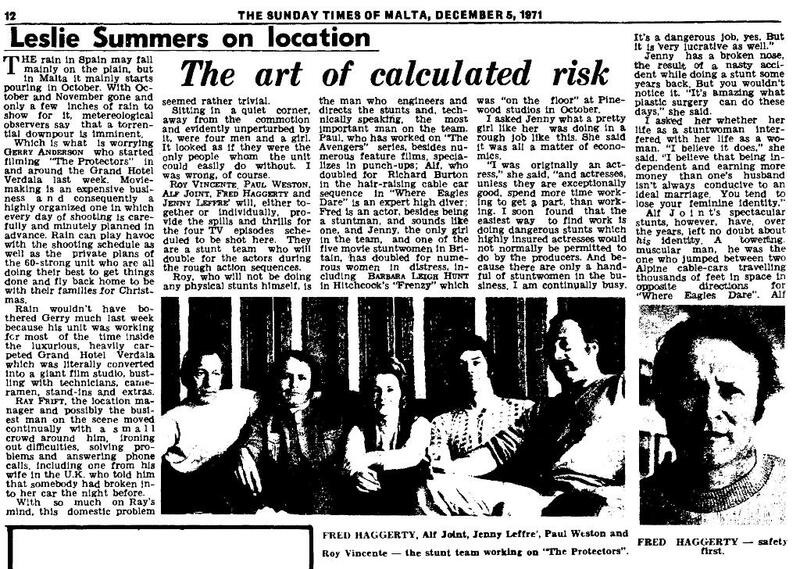 Article from The Times of Malta (5 December 1971), which includes fragments of interview with Avengers stuntplayers. 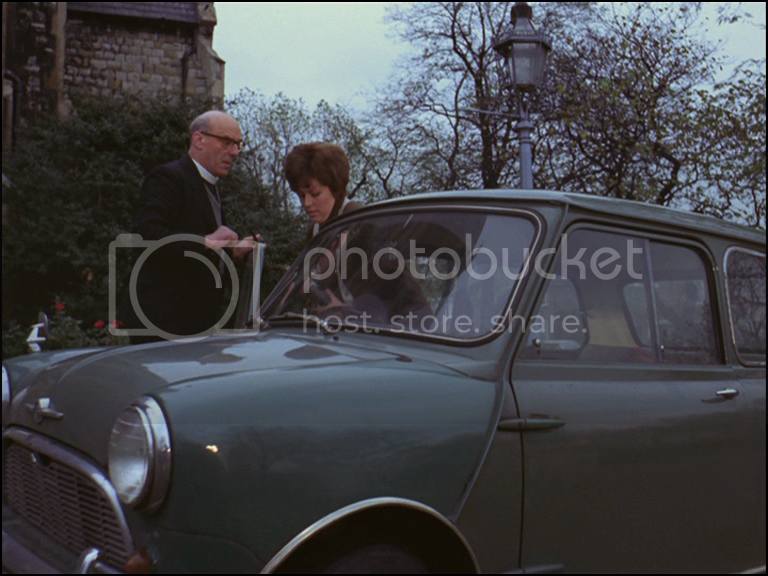 Great, here we can to see photo (though bad quality) of Jenny Lefre, who was stunt double for Sylvia Kay in episode You'll Catch Your Death and Sonia in episode The Rotters. 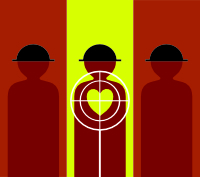 Yes, the different face in profile (and the hair) is when I first spotted it. That happens a few times in fight scenes. I recently noticed Steed's double land at the back of the room and face the camera for an instant in a Series 5 episode. I remember in 'The Decapod' though, it really looks like Patrick doing all the wrestling. Very impressive! It probably was Patrick. Were there any doubles used at all in seasons 1-3? I don't think I've ever noticed one. Honor did her own stuff, of course, and they didn't really have time to orchestrate fights with lots of cutting back and forth to cover up doubles, even though they didn't do the fights "live." There are even publicity photos floating around of Patrick and Julie Stevens practicing throws and the like. So it probably was him doing all Steed's early fights. Kind of a pity that he didn't keep it up when the Emma era started, though I suppose things got more elaborate then and they didn't want to risk either him or Diana (or Linda) hurting themselves. But they could have at least done the stunt double's hair to look properly, even if they couldn't fix the profile. I didn't phrase that very well - I did mean to say 'it was Patrick'! It's an odd one to include as it would have blown the whole surprise ending to Act Two. Maybe it was just a publicity photo they had a mind to use since Honor was already wet..?